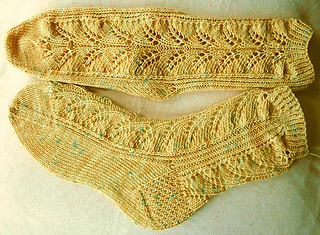 This is the December 2008/January 2009 pattern for the Six Sox Knitalong Group. It is available in English and German. Note: Some test knitters preferred 64 sts on US#1/2.25mm needles and others preferred 60 sts on US#2/2.75mm needles. Some worked the leg on US#2’s over 60 sts and the foot on US#1’s over 64 sts. Swatch: Cast on 60 sts with your chosen needles. Knit 1 round. 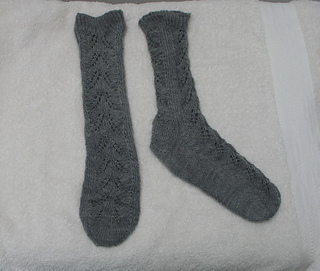 Work the 10 rounds of the smaller pattern chart twice around the sock. Try the sock on. 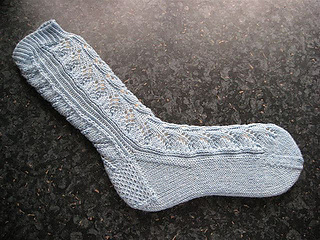 If it’s too small, cast on 64 sts for the sock. 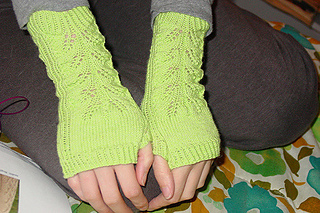 If you used US#2/2.75mm needles and you think the lace looks sloppy, switch to smaller needles and cast on 64 sts. 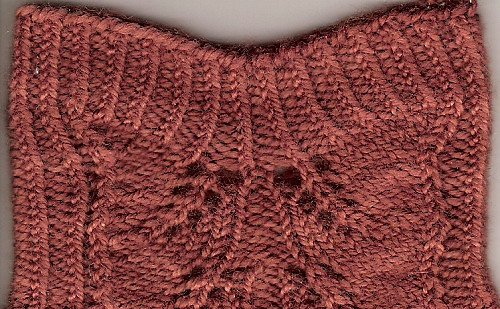 The photos you see at left were kindly shared by the test-knitters, and two knit-a-longers. From top to bottom, you have Janvi’s socks, Linda’s sock, some wristlets, Debi’s socks, and my own cuff detail.